The Riedel Merlot Wine Decanter is the latest addition to our collection by Riedel, the world-famous makers of fine crystal. The casual, carafe shape of this decanter makes everyday wine service exceptional. Classically contoured of lead-free crystal, it gives panache to vin ordinaire, but is no less elegant for decanting and serving your finest selections. The new Riedel Merlot Wine Decanter is the latest addition to our collection by Riedel, the world-famous makers of fine crystal. 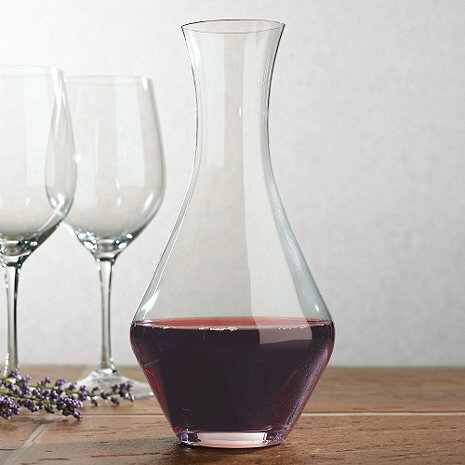 The casual, carafe shape of this decanter makes everyday wine service exceptional. Classically contoured of lead-free crystal, it gives panache to vin ordinaire, but is no less elegant for decanting and serving your finest selections. what is the width of the opening? Trying to find a stopper with the correct dimensions. BEST ANSWER: The opening is 2.5 inches. What is the width of this decanter? My wife and I attended a wine glass comparison event by George, the tenth generation Reidel from Austria when we were visiting Austin Texas. It was quite eye opening. In any event the spotlight turned to decanters. George explained that decanter makes a difference as it releases the preservatives and CO2 thus opening up the young wine more(in older wines this would have occurred over a longer span through cork-outside air exchange). He said once you pour it into the decanter, give it a shake for 10-12 seconds. Then he put the mike at the mouth of the decanter, and the volume from the above process was clearly audible. You'd never think this is what's going on! This decanter is perfect for that purpose. Give it a shake, maybe two 10 second shakes in 2 minutes, and you'll be ready to pour out and reuse. I am glad Reidel has come out with a lower priced item in this economy. It's a double win as you can buy younger (read cheaper) reds and enjoy them. Best little decanter we've seen. Good decanter if looking for a relatively small one - holds one bottle perfectly. Two of these work great at a large dinner table. This is a sleek, stylish little decanter. We are learning about ways the breathe wines, and I think if we pour with the aerator and use the decanter to 'stand and breathe' we can certainly release even more of the flavors. I'm posting the size as a "con" -- if you are serving a large party you'll be refilling and standing this; but for a few friends it will be perfect. We use this strictly for red wine and use an aerator when the wine is poured into the decanter. Very attractive design and nice shape for easy pooring. A nice half bottle decanter, perfect for two glasses of wine. The glass is thin and has a feel of quality. A big step up from the old "milk bottle" glass decanter that it replaced. A useable decanter that pours well and looks elegant. It is OK for 1 bottle of red wine, but for a large party you will need several of these. These Riedel decanters are a great value and very nice to use. I have four in three different sizes to give options to decant and serve my wines. Nice feel and they pour well. Both the glass and wooden ball stoppers work well. Purchased the Riedel Merlot Wine Decanter as a gift for my wife to enjoy her favorite Napa Valley Merlots. Elegantly presents and serves the wines as per my expectations. Cheers! I was pleased to see such a great product at such an affordable price. A great gift idea and a great product that can be used for your own pleasure. I stock up on these for gifts. The decanter is a gift paired with a nice wine for my picky sister. [...] I was really impressed, and they look nice. [...] I'm very pleased and hope that my sister loves her gift! I gave this item as a gift. It is lovely! You need a wine decanter. This is a wine decanter. A nice and inexpensive one. You need a wine decanter. Pretty simple, right? P.S. You can use it for more than Merlot, most of the breathing is done as the wine gargles out of the bottle and into the decanter. When I ordered it, it was supposed to be "In Stock". When I hadn't been charged after a week, I inquired and found out that it was on backorder. I would have preferred getting it sooner, but otherwise I have no complaints. This decanter was recommended to me by a wine expert. It is the perfect size for a 750ml bottle. It's easy to grip and use, and it takes up little storage room. After using the decanter, give it a quick rinse, fill it with hot water, drop in a denture cleaning tablet, wait about 15 minutes, then thoroughly rinse and dry, and its ready for the next use. I bought this at a great deal at XMAS, and have used it many times since. I love the sleek design, it's easy to hold, pour from and clean. Ran through the dishwasher and came out great. Best of all it doesn't take up a lot of room on the table!! I use it for all reds, not just Merlot. Also use it as a water globlet. Loved it so much bought another for a friend. The best decanter I own because it works and it isn't a colossal pain to wash. It is also good looking and affordable. It adds style to our wine serving. Perfect size for one bottle, classic shape, nice quality. For the price and considering it's a Reidel, you can't beat it. It makes a stunningly eloquent appearance at the dinner table. Not easy to clean due to shape, but appropriate brushes will suffice. This is our second one. We often use both of them when we're having a dinner party. It doesn't look like it, but it holds a full bottle of wine. Can't go wrong with this purchase! Purchased the Riedel Merlot Wine Decanter to go with the Vinturi to aerate wines. It works well with the Vinturi for a single bottle of wine. Only holds half a bottle, then it starts to narrow. The size is perfect for the two of us. Use the decanter to help aerate the wine and serve from. Decanter has the feel of a fine wine glass. Haven't tested the dishwasher safe part. Just feels a tad too delicate for that.Hand washes easily. This decanter made an incredible difference in the taste of our wine. Excellent to measure out the just the right amount for dinner for two allowing quick preservation of the wine remaining in the bottle. This decanter is so tiny that you should only pour half of your bottle of wine in it. I had bought it as a gift, but it was so small I kept it and will use for tea in the summer. Cute and simple, which I do love. Don't let the photo fool you. This is nothing like the Riedel Cabernet decanter. It's HALF the size and will BARELY fit a 750ml bottle of wine. If you only open 375ml bottles, this is perfect. If not, don't waste your money.